Customize your skin treatment with multi-masking. 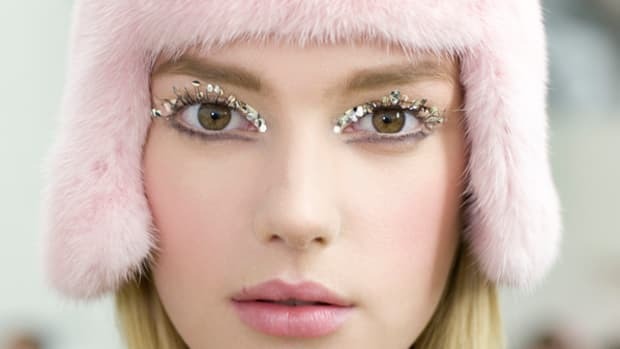 Most beauty trends spawned by social media are kind of questionable. 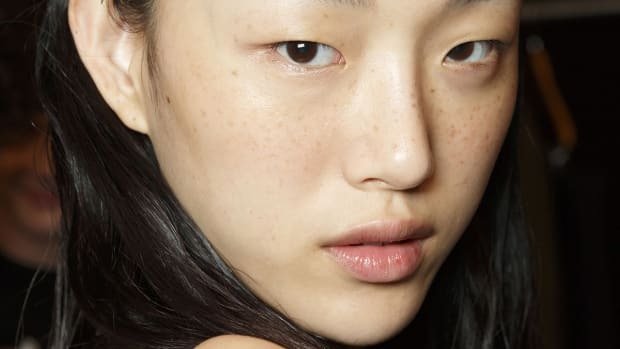 But there&apos;s a new skincare technique generating buzz that actually does make sense: multi-masking! As in wearing multiple face masks on your face at once. We can trace the trend back to Boscia&apos;s Multi-Masking Medley, a kit with four masks and instructions for how to mix and match them, depending on your skin&apos;s needs. 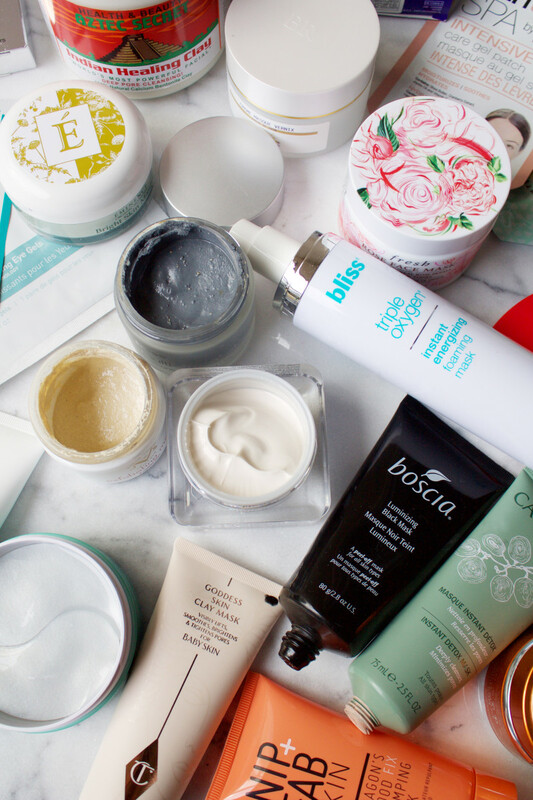 Multi-masking with products from Boscia, Charlotte Tilbury, Caudalie and Patchology. Personally, I LOVE this idea and am getting way more mileage out of my mask collection lately. 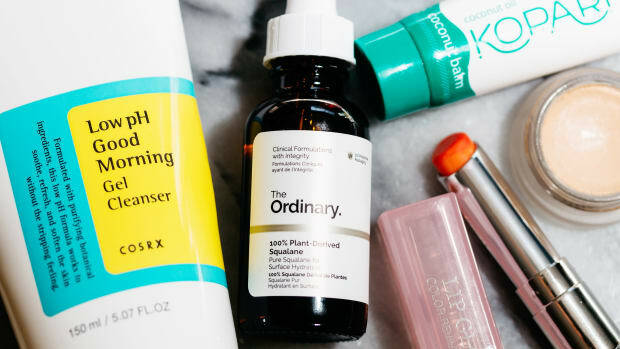 And my skin feels sooo good afterwards—it&apos;s mattified where it gets shiny, brightened where it was blah and soft where it was dehydrated. Multi-masking is when you apply multiple face masks, to different parts of your face at once, in order to treat different skin concerns. For example, you might want to use one type of mask to treat your T-zone, another for your cheeks, and yet another around your eye area. That&apos;s because the skin on different areas of your face is obviously not all the same. The forehead, nose and chin have the highest concentration of oil glands, while the outer corners of the eyes have the least (and are in fact the thinnest areas of skin on the body). So applying just one mask all over doesn&apos;t really cut it. Think of multi-masking as a customized facial. It&apos;s the exact same concept that many estheticians have been using for years in their professional skin treatments—only you can do it yourself, anytime, at home! Multi-masking is an ideal treatment for combination skin. Most of us, at some point in our lives, will experience this skin type, whether it is normal-to-oily or normal-to-dry. Depending on the time of year and even the time of month, skin can have areas of increased oil production, acne or tightness/dryness. Heck, some of us might even be #blessed with all those issues at once! Multi-masking is also suitable for normal skin that might just need a boost. There are masks out there that will help skin look brighter and more luminous, and also work on pigmentation for a more even tone. The one skin type that must be cautious about multi-masking is sensitive. Any time you are using multiple products on your face, there is a greater chance of causing irritation. If you have sensitive skin and want to try multi-masking, make sure to choose gentle products and test each mask on its own first. With multi-masking, you can completely customize your treatment based on how your skin looks and feels that day. Simply look in the mirror and feel around with your fingertips to determine which parts are oily, dry, clogged and so on. Use your preferred (ideally gentle and non-abrasive) face wash to cleanse your skin. Pat dry with a clean towel. The reason I always recommend a gentle exfoliation step before masking—multi or not!—is because dead skin cell build-up can block penetration. On a freshly exfoliated surface, more of the beneficial ingredients in your masks can get to where they need to go. The Exfoliating Mask from Joanna Vargas Skincare. A cleansing brush: Think classic Clarisonic (read my thoughts on them here) or the newer Foreo Luna. 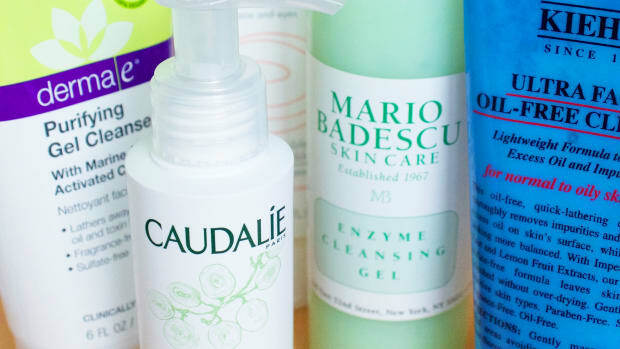 An acid toner: Try the Mario Badescu Glycolic Acid Toner or my beloved Biologique Recherche Lotion P50 (reviewed here). Acid-soaked exfoliating pads: I&apos;m using the Proactiv Clear Zone Body Pads now (they can be used on the face) and they&apos;re great. 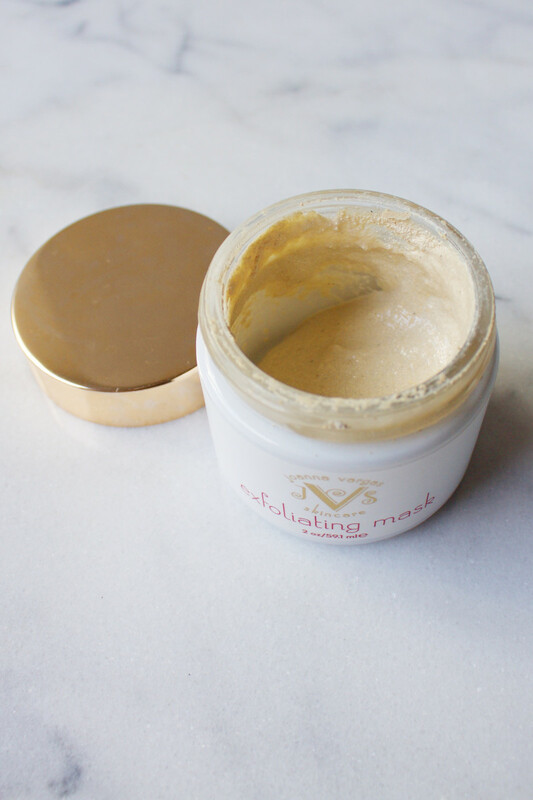 An exfoliating mask: I adore the Joanna Vargas Exfoliating Mask. You massage it in as a scrub for one minute, and then leave on for five more minutes. Can&apos;t say enough good things about it! Steaming is a popular component of most professional facials. It helps to warm and soften your skin, making it more receptive to masking. (It&apos;s also super-relaxing!) You can drape a hot, wrung-out towel over your face to create steam, or stand over a pot of boiling water with a towel draped to catch the steam. No matter what, make sure the temperature is comfortable first, so you don&apos;t burn yourself, and only steam for a minute or two. Avoid steaming if your skin is sensitive or irritated. If you are using any type of purifying, detoxifying, balancing or pore-tightening mask—it will often have drying ingredients such as clay, mud or charcoal—then apply that to the target areas first. Usually, you want this type of mask to go on your forehead, nose and chin, which are the areas most prone to increased oil production, enlarged pores, blackheads, whiteheads and acne. If you experience these issues on your cheeks as well, then by all means use these masks there, too. Make sure your mask application is about a finger-width away from your hairline and eyebrows. Smooth on just enough to create an even layer. 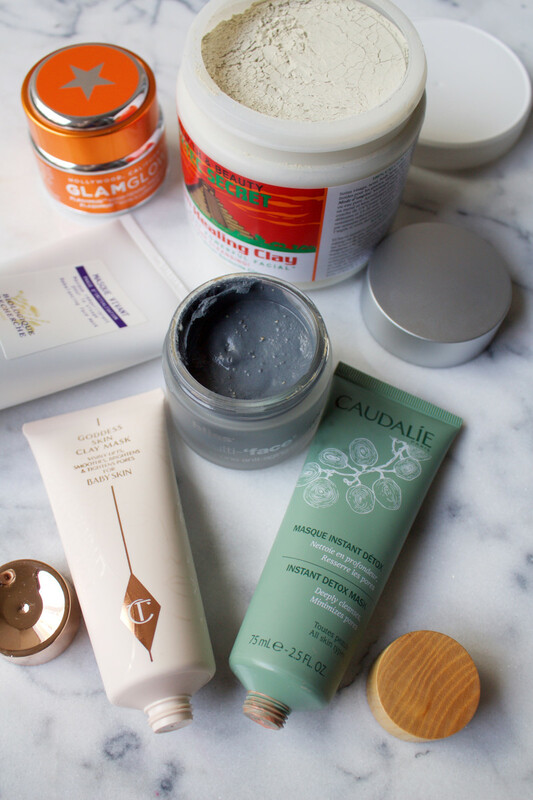 Purifying and balancing masks from Caudalie, Bliss, Charlotte Tilbury, GlamGlow, Biologique Recherche and Aztec Secret. Caudalie Instant Detox Mask: Contains pink clay to soak up impurities, plus papaya enzymes for an exfoliation benefit. If you like your masks to really tighten up as you wear them, you&apos;ll like this one. Charlotte Tilbury Goddess Skin Clay Mask: If, on the other hand, you don&apos;t like masks that prevent you from moving your face, this one&apos;s for you. It&apos;s a clay mask that is actually hydrating and smoothing, in addition to pore-tightening. You could put this on your cheeks as well as T-zone. GlamGlow Flashmud Brightening Treatment: The latest in this brand&apos;s range of kaolin clay-based mud masks, this also includes brightening agents. Bliss Multi-&apos;Face&apos;-eted All-In-One Anti-Aging Clay Mask: This one has 10 percent glycolic acid, in addition to kaolin clay, for a great deep cleanse. Jojoba oil keeps it hydrating. Biologique Recherche Masque Vivant (reviewed here): Not the best smell, but boy does it work! A really great balancing mask for oily, combination and acne-prone skin. Aztec Secret Indian Healing Clay (reviewed here): Not technically a mask, but if you mix the bentonite powder with a bit of water to make a paste, it&apos;s a DIY clay mask that works amazingly well to dry up active acne. Next, put on the masks that treat dry, dull or aging skin. 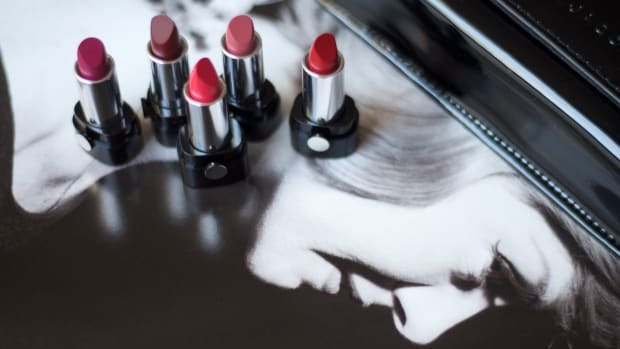 These will often have a serum, lotion or cream texture and usually go on the cheeks. This part of the face tends to be normal, not too oily nor too dry (although it can be!). However, it is where your skin can often look dull, uneven, sun damaged and just lacking a glow. You may want to apply these masks to your neck and around your eyes as well. However, keep in mind that the skin around your eyes is the most delicate and the most sensitive. Never use a mask around your eyes that is meant for the T-zone, such as clay. Instead, use masks that hydrate or firm. 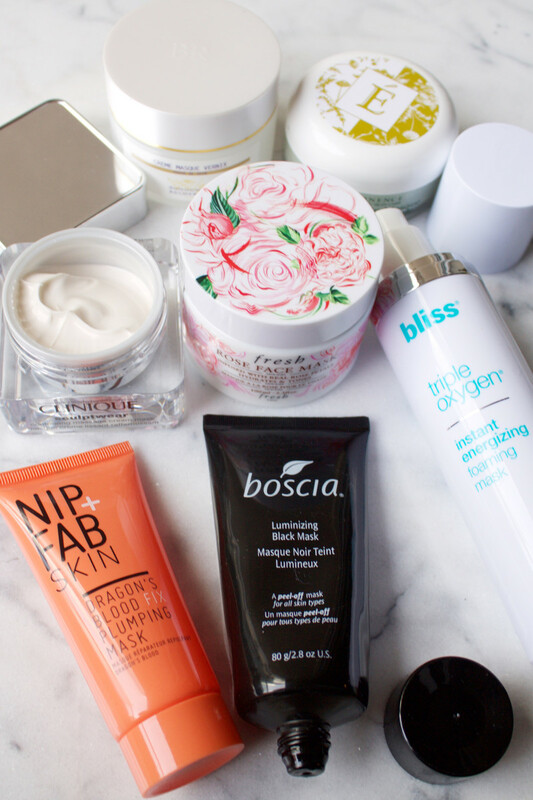 Hydrating, brightening and firming masks from Fresh, Boscia, Bliss, Nip + Fab, Clinique, Biologique Recherche and Éminence Organics. Fresh Rose Face Mask: Not only is the packaging gorgeous, but the mask itself is heavenly. It is a hydrating cucumber and aloe vera gel formula, infused with rosewater and real rose petals (!!). Bliss Triple Oxygen Instant Energizing Foaming Mask: This is one of my all-time faves to boost skin circulation (thanks to the foaming) and give your cheeks a rosy glow. Kinda like your own oxygen treatment at home! Boscia Luminizing Black Mask: Another one I&apos;ve used for ages. It goes on jet black and peels off to reveal brighter, glowier skin. Love it. Nip + Fab Dragon&apos;s Blood Fix Plumping Mask: Why pay more for Rodial when sister brand Nip + Fab&apos;s masks are practically the same? This has a gel texture and is rich in hyaluronic acid. Clinique Sculptwear Contouring Massage Cream Mask: With a rich, creamy texture, this mask is designed for facial massage and leaves you with a dewy texture. It can be tissued or rinsed off. Biologique Recherche creme Masque Vernix: Anyone who suffers from winter dryness will like this mask! It sounds weird, but it is inspired by the emollients that protect newborn baby skin. Éminence Organics Bright Skin Masque: I&apos;ve never met an Éminence mask that I didn&apos;t like. This contains natural skin brighteners in an aloe vera and zinc oxide base. Some proponents of multi-masking actually layer their masks on top of one another. If you want to try this, you would leave your first mask on for about five minutes before massaging in a second mask layer. This can work if you are using lightweight masks with serum or lotion textures. It won&apos;t work with drying mud masks or peel-off masks, however. Also, be aware that first layer will be the most potent; other masks that go on top will be diluted. Personally, I think it&apos;s probably better to just let one mask do its thing at a time! Patches are a new delivery system in skincare. Usually they are shaped for specific trouble spots, like the eyes or lips, and are infused with active ingredients. The patch forms a seal that accelerates penetration and prevents the product from evaporating too fast. Most are worn for about 20 minutes. Eye and lip patches from Patchology, Sephora Collection, Skyn Iceland, Spa by Look Beauty, Klorane, G.M. Collin and The Face Shop. Patchology FlashPatch Eye Gels: You get a 30 pairs of gel patches, which contain hydrating ingredients and caffeine to de-puff. Such an innovative concept. Sephora Collection Pomegranate Eye Mask: You can choose from eight types of single-application fibre eye masks. The pomegranate is for reducing signs of fatigue so you look more rested. Skyn Iceland Hydro Cool Firming Eye Gels: Forget cucumber slices and try these! They feel nicely cooling on the skin and I love that you get the anti-aging benefit of peptides. Klorane Smoothing and Relaxing Patches: You get seven sachets with a pair of eye patches in each; these ones soothe, decongest and refresh the eye area. G.M. Collin Instant Radiance Anti-Aging Eye Patch: Here, you get five pairs, and they are designed to reduce under-eye bags, dark circles and fine lines and wrinkles. Spa by Look Beauty Dark Circle Reducer Eye Patches: An affordable option for treating dark circles; these you can even wear overnight. Spa by Look Beauty Intensive Lip Care Gel Patch: This is a lip-shaped patch with shea butter, jojoba oil and vitamin E. Should come in handy for the brutal winters! The Face Shop BeBe Lip Mask: The package is so cute. Another lip-shaped patch, this time with hyaluronic acid and marine collagen. Follow package directions, but most masks will need to be worn for at about 15 to 20 minutes. So lie down and have a snooze! Remember that part of the reason you look better after a professional facial treatment is simply because you&apos;re forced to do nothing and just relax. Multi-masking at home should be no different. Completely remove the mask from your skin with water. Some people like to use the hot towel again here, draping it over the face to make mud and other thick-textured masks easier to remove. Let the steam soften the masks for a minute or so, and then wash everything off. Tone and moisturize as usual. Mix and match your masks for best results. Tighten and brighten your T-zone with GlamGlow Flashmud Brightening Treatment. Give yourself a glow with Bliss Triple Oxygen Instant Energizing Foaming Mask. Hydrate the eye area with Sephora Collection Pomegranate Eye Mask. Gently exfoliate with Joanna Vargas Exfoliating Mask. Refresh and hydrate tired skin with Fresh Rose Face Mask. Soothe your eye area with Klorane Smoothing and Relaxing Patches. Draw oil and impurities out of your pores with Aztec Secret Indian Healing Clay. Balance out oil production with Biologique Recherche Masque Vivant. Tighten pores and hydrate with Charlotte Tilbury Goddess Skin Clay Mask. Give yourself a facial massage with Clinique Sculptwear Contouring Massage Cream Mask. Target fine lines with Skyn Iceland Hydro Cool Firming Eye Gels. Restore lost moisture with Biologique Recherche creme Masque Vernix. Fight a dehydrated eye area with Patchology FlashPatch Eye Gels. Soothe chapped lips with Spa by Look Beauty Intensive Lip Care Gel Patch. Do start slowly. 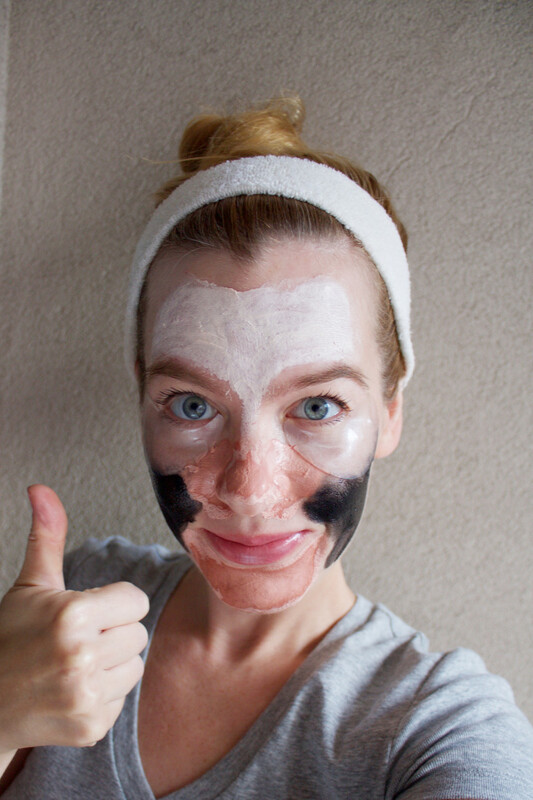 It&apos;s a good idea to start multi-masking with just two masks, and determine what your skin needs from there. Try it out once or twice a week, and adjust as needed. If you start with, say, five different masks, it will be tough to figure out which ones are really working. Do test your tolerance. The more products you use, the higher the chance of having an allergic reaction. 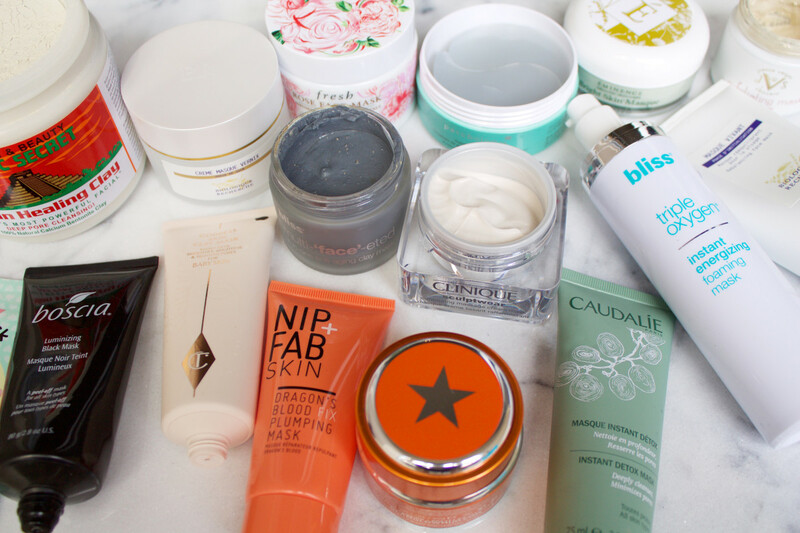 If you have sensitive skin, test out each mask on its own to make sure you tolerate it. Do read package directions. Know what goes where, and for how long. Always find out if the mask you&apos;re considering is suitable for your skin type. Don&apos;t waste product. Most face masks only require a light application to get the benefits. Peel-off masks are the exception, and do need to be spread more thickly so they&apos;ll pull off easily. Don&apos;t rely on masks to treat serious skin concerns. Multi-masking is great, and I have no doubt it can support your skincare goals. However, keep your expectations realistic. It&apos;s probably not going to permanently soften wrinkles or wipe out acne. If you have an going skin concern, you&apos;re going to see more results from a consistent twice-a-day home care routine. Have you tried multi-masking? 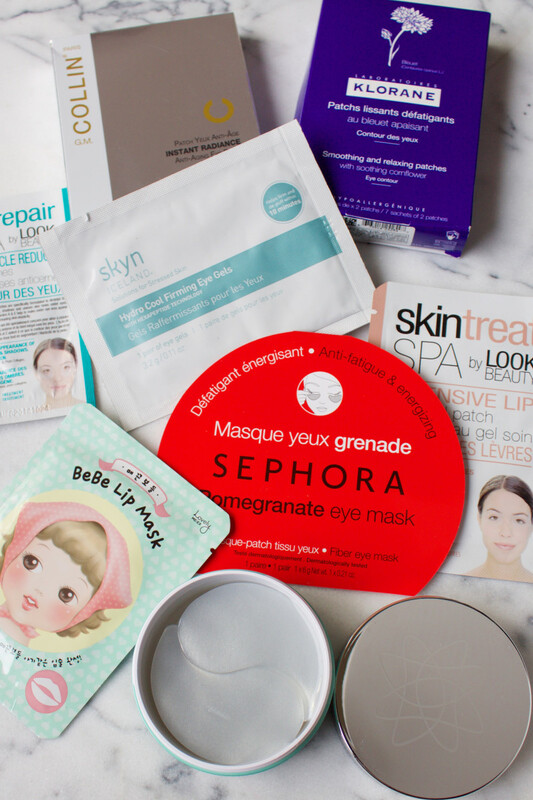 Which masks do you love?